The topic that I was asked to speak on today was "Speaking the Love Language of Your Mate". First of all, had Roger and I known our own and each other's love language years ago, it would have certainly saved us some hurt feelings. For example: We got married in August. My birthday was in October. He had always done good with birthday presents, etc. I was expecting him to" knock my socks of"f with this being our first time to celebrate it married. That day, he took off work. Helped me clean up around the house. We worked on several to-do lists together. We just did all kinds of things together. That night, we got dressed up and he took me out to eat. We came home.....as it got later.....I began to pout......I was hurt. FINALLY, out of anger, I told him I was hurt because there was no card; no present and no cake. He kept saying that he was sorry but he had spent the day with me so he did not have time to get anything. WRONG ANSWER. Late that night, he was out begging the manager of Food World to open the bakery and sell him one of the cakes and he grabbed some perfume and a card..................but it was too late. Over the years I was embarrassed over my selfish actions. After studying the Love Languages and discovering mine and Roger's.........I realized what the problem was. Roger's Love Language is QUALITY TIME with Act of Service running a close second. He was working in construction at the time. He took the entire day off to spend it with me. He HELPED me in the house. He worked on to-do lists and he took me to eat....................so he was showing me HIS love language in every way he know. The problem was........my Love Language is RECEIVING GIFTS with Word of Affirmation running a very close second.. It is not about money. The gift could have been as simple as picking me a bouquet of wild flowers and writing me a sweet note. The time and effort put into it was what I was looking for to make me feel loved. Therefore....when he said, "I didn't have time.......I lost it and reminded him that my birthday had not changed so he had had 365 days to prepare. All of this sounds silly....................but had we known our own and each other's Love Language.............it could have been avoided all the way around. What is your love language? What is your husband's love language? Word of Affirmation - Word people: they need encouragement, compliments, reassurance, etc. Receiving Gifts - is not materialism; thrives on the love, thoughtfulness and effort behind the gift. Quality Time - they need your full, undivided attention. Acts of Service - they want you to do special things for them like making dinner, fixing a favorite dessert, or just helping them. If you don't know your husband's love language or even yours.....I would like to encourage you to read Gary Chapman's book and discover it. I DO believe in the Power of Prayer......I guess that is why it appears that this entire week of blog is full of PRAYER REQUESTS. I am typing this ahead of time because today, Roger and I are in Pigeon Forge at the 2015 Bi-Vocational Ministers and Wives Retreat. Last year our granddaughter was born and we MISSED the retreat. That was the first retreat that we had missed in 15 years. Therefore, we have really looked forward to going this year. However....I need your prayers. I am a one-on-one person. I do not do large groups....even though I am a teacher. (That is different....) Someone said, "Hey, you blog every five weeks." That is different also. When I blog, I do not see people. Also, if a person does not want to read what I blog, they can skip it. Anyway, I was asked to be the "bi-vocational wife" that leads one of the sessions at this retreat. Now, for any of you bi-vocational wives.......we ALL KNOW that Jenny is "suppose" to lead our sessions. We LOVE Jenny; she is so REAL. However, this year, Bro. Ray wanted to invite Randy Davis and Jenny to be a part of our retreat, but to also give them some down time where they could sit back and relax since their schedules are very demanding throughout the year. I got volunteered to be the "other speaker". I follow JENNY on Friday. TONY RANKIN (who we all know is also a wonderful speaker) will be leading the men at the same time that I am leading the women. Did I mention that speaking in front of large groups is NOT anywhere near MY COMFORT ZONE? One thing about it....since speaking is out of my box, every time I DO find myself in a position where I am speaking at groups, I HAVE to lean on God....because Kathy can not do it herself. All jokes aside..........I DO NEED YOUR PRAYERS......I will be speaking from 10:45-11:45 tomorrow, Friday, January 30th. PRAY that I will feel God's presence. Pray that He will remove my anxiety. Pray that I will be KATHY and not worry about everyone else. December 16th I blogged out of turn with a VERY URGENT PRAYER REQUEST: our daughter-in-law's mother had been diagnosed with breast cancer, etc. Her name is Debbie and she met with the surgeon the next day. He told her that she has Grade 3, stage 2 cancer and that they could not do surgery until she had very aggressive Chemo. They did a body PET SCAN on December 23rd. It appears that the cancer has not spread....but given the type of cancer, they can not take chances. She will have six treatments of aggressive Chemo (over an 18 week span); then a double mastectomy; then probably radiation and more than likely a complete hysterectomy. A week ago, they did surgery and put her Chemo port in. This past Thursday, January 22nd, she had her first aggressive treatment. PLEASE keep her in your prayers. Although the road is not impossible, she does have a very bumpy, long hard road ahead of her. Also....pray for her family: our daughter-in-law and son; her other two daughters and a son-in-law; her granddaughter; her mom and dad. PRAYER CHANGES THINGS...............and like Tonya said, THERE IS POWER IN PRAYER. 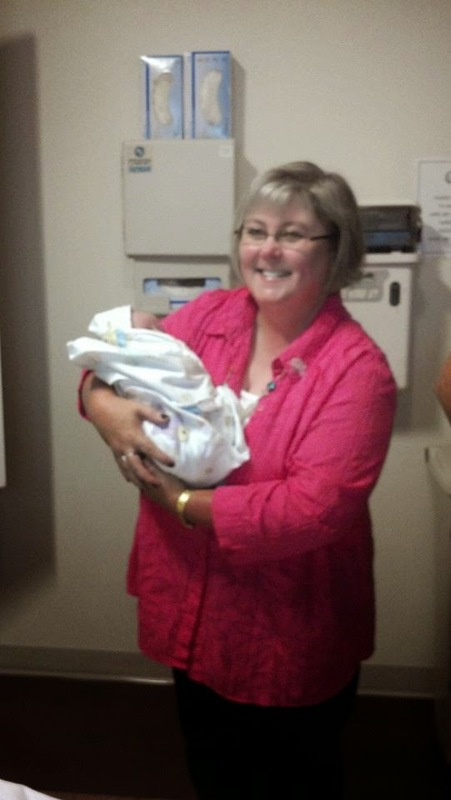 Here is a picture of sweet Debbie when her granddaughter was first born....so that you can put a face with your prayers. Thank you in advance for the prayers. Our church has been growing and was really on fire for God. I mentioned several blogs ago to really pray for us because when "Good Things Happen", Satan is waiting to do whatever and use whoever he can to tear it down. Satan is currently working over-time. What started out as adding a little praise music to our Baptist Hymns and people complaining........quickly turned into "the younger ones that are on fire for God and bringing people in coming and going"............to the "older ones" complaining that the younger ones were taking over etc. The "ones being used of Satan" are threatening to withhold tithes. Roger told them to keep their money; God would not bless money given so begrudgingly....and to not worry....God WOULD get HIS money and with interest. It has gotten very nasty. Our church is made up of about 80% of people under the age of 35. However, the ones that are being used by Satan, have now decided to wear those phones out and see if they can just get rid of the preacher.........".then the younger ones will leave...and their problems will be solved." Roger is so close to throwing the towel in and walking away. He says it is hurting his health, etc. I feel that it is just Satan....and that most of our congregation is younger anyway, but he is so discouraged that he does not want to battle. He said, "I have not done anything wrong. All I have done is love them, pour our God's Word to them and try to keep peace." I might add that initially, when he thought the battle was over the music, etc., he said if he left it would be because Roger wanted to leave and not because God said to leave....and THAT WOULD BE WRONG. He then said, I KNOW this is the direction that God is leading our church so I am going to see it through. This was ALL BEFORE they started the campaign to "VOTE THE PREACHER OUT". He feels it is a lose-lose situation and he is loosing a battle he never wanted to fight. He said that right now if he leaves..........the younger 80% will leave and find them another church that they can work in and wins souls to Christ........and the 20% will stay, be happy and watch the church die along with them. I keep trying to encourage him to not give Satan the victory, but it is getting harder and harder for me to encourage him when I am resenting all of the hurtful things and daggers when thrown at us. I keep telling myself, what I tell everyone else........the people are not the enemy. Satan is the enemy. We need to pray for the people because they are being used of the devil..............................BUT.....in the middle of the storm it is hard to let that sink in. Ladies....how do you encourage your husbands...when you are getting so discouraged yourself? This is tough. We have at least five families that are wanting to join our church and we would not be surprised to see them walk the aisle at any service, but right now, Roger says that the way he feels, he could not let them join.........because he does not think it is fair to them to join into a war....and not even know what kind of internal turmoil is brewing. Please PRAY for our church and for Roger. And, please, if you have ANY suggestions on how I can ENCOURAGE him when I don't feel very uplifted myself, I would welcome any and all suggestions. On December 28, 2014, our church threw a BIG BIRTHDAY PARTY for Mrs. Mahalia Cooper, who was 100 years old. She outlived her husband and all four of her children. She buried one son last December and the last son in March. The only thing that kept her going was.....for a year, she could not wait until her birthday party. She was so excited that day. After her party, she was ready to go home. Less than a week later, she was in the hospital and from there went to the nursing home. This past Thursday night, she met Jesus face to face. I am sure she is running the streets of gold in her new body as I type this. I know we all have "Mrs. Mahalias" that really make a mark in our lives, but I wanted to share mine today. I feel very blessed to have known Mrs. Mahalia and called her a dear friend for eighteen years. I have blogged about Mrs. Mahalia at least twice; once last December when I mentioned about the 99 year old who cooked a DELICIOUS lunch for us. Then in July, I mentioned her when I posted pictures of Squash Relish that I had made from her recipe. I even posted the recipe. The Resolution to Be "That Mom"
I didn’t know I had done it. I had prepared, fed and washed the last bottle for my youngest and, Lord-willing, last baby. Actually, I didn’t have a clue that it was really truly over until I began to move the bottles from my kitchen cabinet to the Goodwill box. After reading a blogged linked from Facebook, this past fall, I knew it was going to happen. The “have to” of prepping and washing bottles along with a laundry list of other parental responsibilities would be quickly passing. I would no longer “get to” do these things for my babies. With my oldest child, I encouraged and welcomed these milestones. I couldn’t wait for her to dress, bathe and feed herself. Now, with feeling as though God has said our family of five is complete, I am not so anxious for these days to pass. They are fleeting quickly enough on their own. So, over the holiday break, when any one of my three girls asked me to put them to bed, read them a story or play a game with them, I did it. When I felt tired, I reminded myself that THIS day is a gift from God and a limited opportunity to be with my child. The day will come when I am no longer wanted at bedtime, or needed to prepare a PB&J. As I've written earlier this week, I'm not really making resolutions this year. But, I am striving to see things differently. This part of my life is no exception. The things I have thought of as endless chores, I will now see as a fleeting opportunity to be the mom I really want to be, the mother I am called and equipped by God to be. Honestly, I guess I am committing myself to a change of attitude. I am giving thought to how I do want my girls to remember me and I am committing myself to be “that mom.” I don’t want my girls to remember me as busy or tired or hurried or hassled. Like with any resolution, I know I will fail sometimes, and I am thankful that God’s grace will cover that. In my last post I mentioned procrastinating something I knew God was calling me to do. I am all too often more guilty of sins of omission than sins of commission. I know God is wanting me to do something and I put Him off. One of those things I knew He was wanting me to do was to take up scripture memory again. I had lots of excuses, including the fact I can barely keep my three girls' names straight. (I am always calling each them by one of their sisters' names!) How was I going to be able to memorize scripture? God was persistent though . . . I had seen where several Facebook friends were participating in Beth Moore's scripture memory program and had intended to check it out . . . when I had the time . . .
Then a good girlfriend from the last church we served texted me. She said God kept bringing me to her mind and felt compelled to invite me to join her in that same challenge. So, I did indeed check it out. As I read through the requirements, I knew God was asking me if I was finally going to be obedient. I knew I had to do it. However, I would NOT call this a resolution! For me this is all about faithfully doing what God had laid on my heart. So, I was on board, but what scripture would I memorize? God had that covered too. I scrolled through the verses other ladies all over the country had already selected. Then I saw it. It was the first entry with a picture so it caught my eye. Then I read the sweet lady's name. It was my maiden name. Ladies, my maiden name is Rambo, not a common name. I felt sure that this was God's way of pointing out what verse He wanted me to commit to memory. Literally, within the following 24 hours, God confirmed that He is doing a "new" thing. He is a God of "new" and He knew that I would need the promise that He would make a way . . . I did memorize it. My sweet friend has encouraged me and already held be accountable. We have begun our second verse too. This time I am working on Joshua 1:9. I have already been so blessed by this process. I am so thankful that He persistently pursued me into a closer, deeper walk with Him. Dear Sisters, please don't neglect what "new" thing God is calling you to do today. Remember, each morning is a grace-given "new" opportunity for Him to do a "new" thing in you! You won't regret it! I just heard on the evening news that now is the time most of us give up on our New Year's resolutions. What about you? Did you make any? Have you given up yet, or are you going pretty strong? Me? I have seen a scant few pounds disappear from the scales. Overall, I am drinking more water. And, yes, I have made a trip to the dentist already this January. So, I guess I have seen some progress toward doing a few things I wanted to improve. But, no, I wouldn't necessarily say, I've made resolutions. Those are supposed to be measurable and specific if they are to be kept. Right? Surely, if these things I'm doing are resolutions then I would have written them down somewhere or at least shared them with a close friend so she could hold me accountable. I've done neither of those things. Instead, I've looked at January as a chance to take advantage of the "new" of the New Year. 2015 is His grace giving us a new year, yet He gives a lot of new. Each dawn is a new day with new things that He has prepared in advance for us to do. Each day His mercies are new. Every morning God gives us breath, He gives us a new beginning. God is a God of "new" things. He is making all things new. He is making me new. Yes, there were a few things I knew He wanted me to do and I did sinfully procrastinate and wait until the New Year to begin them. But, I know that He's forgiven me and tomorrow is a new day no matter if it is the 1st of January or the 20th of January or even some random date in the middle of the year. He is the God of new and He is mine. So, as I wish you a Happy "New" Year know that the happy "new" I'm praying for you is so much more than just a greeting used this time of year. Where have I been?? Well, I have been to Africa—but that was several years ago. I have been to work—but that was a couple of days ago. I actually have been to lots of places. What was she referring to? I just came from home….or my car. Oh no!! Did she see me run into the store and get the biggest Butterfinger candy bar that exists to woman and scarf it down as I drove?? Where have I been??? It was a loaded question…but I knew what she meant. She had not seen me at church. So…..I did some quick thinking and mental calculating….have I missed church? Nope! Been there! Shew!! Ah-ha….then it hits me! I filled in for someone who could not work in the nursery because they were out of town so I have been doing child care more than my usual once-a-month time. Gasp! What did you just say? You want me to “parade” in front of you so you can “see” me?? And…truthfully, I can’t remember if I actually said this….or was just thinking it….but I might have gone on to say to say something like, “I don’t stay home just for the sake of staying home (OK, well…maybe there has been a time or two that I stayed home because I wanted to). I really am here! Was she serious? Was she kidding? What was I to do with it? Let it bother me? NO! Get all upset and frustrated and tell myself that I wish my husband did anything but pastor? NO! I let it roll off of my mind and heart like Rain-X allows water to roll off of my windshield. I went on to my class as if nothing happened. And yet I ponder….is there some truth to what she said? Do I need to make myself more “seen”? My preference is to be more behind the scenes. Is that wrong? I remember something Diana said in her book, “Six Simple Steps: Find Contentment and Joy as a Ministry Wife” about fish bowl living (have you gotten the book yet? Have you read it? This should be the last time I bug you about it!). Yes, we sort of live fish bowl-type lives as people look for us to “parade” in front of them so they can “watch” us…but the truth of the matter is this: the fish in the fish bowl pay no attention to those who stand around watching them!!! They just keep doing their thing with their eyes on the food!! So, ladies….let’s just keep doing our thing with our eyes on Jesus and not those who are peering into the fish bowl. When Diana Davis was working on her new book for ministry wives, “Six Simple Steps: Find Contentment and Joy as a Ministry Wife”, she sent a note to her contact list of pastor wives with a request for our “wisdom”! “Would you please email me a twitter-size piece of advice that you'd offer to a new minister's wife?” was her request. Her desire was to use them throughout her book…and, sure enough, little twitter-size drops of wisdom from those who have lived the life as a ministry wife splash across the pages of her book. Hummmm….I pondered her request! What smidgen piece of advice would I give a new minister’s wife?? (Well, honestly, my first thought was, “about what size is a ‘twitter-size’ piece of advice???”). My mind and heart was put into motion and a boo-koo (that’s slang for a bunch) of tweet-size thoughts began to spill out onto the computer screen. I thought I would pass on to you what my “twitter-size” thoughts were….and, surprisingly; she actually used some of them in her book!! After you check these out below….I’d LOVE for you all to share what your “twitter-size” piece of advice would be!! There are mean people in church. You have a choice to hold on to grudges or give grace. Give much grace!! Never underestimate the significance of the seemingly insignificant things you say or do or think! Leave at least one thing left unsaid every day! Never tell your children ‘we have to go to church’….instead say ‘we get to go to church’! They will pick up on the positive instead of the negative. Never tell your children that they can/can’t do such and such because they are the preacher’s kid. Could they do it if they weren’t the PK? In one church we served I discovered I was allergic to business meetings! So…I would pray or visit the nursing home or help with kids during that time instead. My first ministry is to my husband and children….and it is freeing to know that pleases God. Do not allow what church members say about your husband (or you or your family) take your eyes off of what Jesus says about your husband, you and your family. Pray for a holy ‘Rain-X’—for the words to simply run off and not penetrate. Now….what are yours??? And...read the book to see what others said! 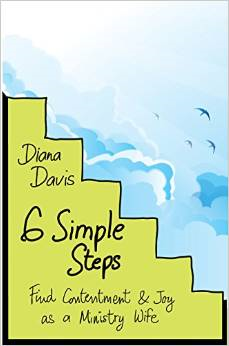 My friend, Diana Davis, has just published an incredible book that every ministry family should have in their library! It is full of encouraging, practical, and inspiring ideas, tips, advice and love. Diana is the real deal (in my mind the ‘perfect’ ministry wife) and she cares a lot about those of us who live and serve in the trenches of ministry. Many of us love the part we play in the Kingdom of God and many of us struggle with contentment as ministry wives. Diana uses her years as a ministry wife to encourage us to continually find joy in the role God has called us to….and the best part is that she does it in such a way that it doesn’t make us feel guilty!! Six Simple Steps: Find Contentment and Joy as a Ministry Wife can also be used as a group study…if you meet with other ministry wives it would be a great tool to use together!! I would encourage you to get the book, read it, and purchase one for every other ministry family you know! (I promise she is not paying me to say this!!) The link below will take you to the book on Amazon. Happy reading and be encouraged!! Have you ever had one of these Sunday schedules? Pre-service praise team and music rehearsal. Wait a minute! Aren't Sunday’s designed to be a day of worship and rest? Why do we think we can pack every activity in on a Sunday? Why do so many ministers’ wives (and ministers) get overloaded? Well, just look at this real schedule one of my sisters in ministry recently submitted to me. Too often our Sundays are packed with activities that take our eyes off the Lord. We jump from one scheduled event to another and never pause to connect to the Lord. Ministers’ wives especially seem to get overloaded. People assume we will attend any and all events that are scheduled on Sundays. In all honesty, I hate Sunday afternoon wedding/baby showers because it is the one day I can take a nap or just simply relax. Of course, I am jumping on my soapbox on this next statement. Our congregations expect ministers and their families to be at EVERYTHING on a Sunday, Wednesday, or other night but they do not make an attempt to attend. At best the average church member will give the church only one hour a week. As a minister’s wife, I try to be gracious and handle the Sunday overload. However, there are times when I am just exhausted. I want a handful of M & M’s, a soft, warm blanket, and an afternoon nap. It is at those times I simply say no to some Sunday events at church. However sisters, I will not skip Sunday School or morning, evening or Wednesday worship. I personally feel as a minister’s wife our families need to set an example to our congregations. If our members see that church attendance is important to us, hopefully they will make it a priority in their own families. *Create a Crockpot meal for Sunday. Place it in the Crockpot on Saturday evening or early Sunday morning. *Have your children work a little each day on their homework. On Saturday make sure the backpacks are packed. *Don’t attend all the showers. You can easily purchase a small gift and personally deliver it to the guest of honor later. *On Sunday, take a minute to pause and thank the Lord for your salvation and for your church family. Also, pray hard for your husband who is also probably running on Sunday overload. I would love to hear what some of your Sundays are like and how you handle the overload. I need the help just as much as you do. When a person brags on themselves, we can get a little defensive and even jealous. Sure, some accomplishments should be bragged about but for the most part, a braggart is conceited and wants all the attention. We tend to avoid people like this. As a minister’s wife, when I must listen to someone brag about themselves all the time, I just smile and drift off into a chocolate covered dream world. However girlfriends, we need to start bragging. You are probably says, “Wait! Brag about myself?” Yes girlfriends, brag! I want you as ministers’ wives to take the challenge this year to brag about what God is doing your life and in the life of your church. Why, because we live in an increasingly lost, negative world who hates the church and God. In the last several weeks I have talked with people in my community and with fellow ministers’ wives. The comments out of their mouths have shocked me. First some of the community people will simply say they do not believe in God or any god. Others have told me they believe in God but not in organized religion because it is boring or there is strife within the churches. Hmm, believing in God and not organized religion sounds like an oxymoron to me. If you believe in God and what the Bible says then you must love the Church. Second, the few ministers’ wives I have spoken with are so discouraged. They do not see God at work in the church where they serve and as a result they are struggling in their personal walk with the Lord. Ladies, God is at work in our churches. Sometimes we have to look real hard to see past the internal strife but He is working-the Word being preached unashamedly, a prayer warrior on their knees storming the gates of heaven for the lost, etc. He is also at work in our lives even when He seems distance. In those cases, it is the individual who tends to turn away from the Lord. Believe me, I have been there but when I look back, I can see God all over my life. So sisters, become braggarts! What is God doing in your personal life? Have you been healed? During your quiet time is God revealing more and more to you? Has God walked with you during a dark time and brought you out in victory? Brag! Also, brag about what God has been up to in the church where you serve. Are people being saved and families joining? Is the Truth preached and taught? Brag! Girlfriends, the world outside (and sometimes within) our church doors is LOST! The one thing we can do as Christians is to boast about our Lord and what He is doing in our personal life and in our church. So brag away! I didn't do it. He did. I made it through the whole month of December without my lists. When I last blogged, I wrote about how overwhelmed I was with everything that was going on and had to be done. I shared how I was concerned that I would miss or forget something important. I was struggling with letting Satan steal away my joy and missing the true meaning of Christmas. When I last blogged I had begun multiple lists. At first it was unintentional on my part. I didn't set out to test God or anything like that. I just committed to taking each day as God gave it to me and to give it back to Him. In the following days I realized that instead of helping me, my lists were actually hindering me. They were contributing the stress I was trying to use them to relieve. They were my feeble attempt of having some kind of control over my crazy life. At that point I never looked again at the lists I began. I didn't even write my weekly to-do or grocery lists. Yet, everything got done. Nothing was forgotten. AND, I had the best advent season I can remember. My kids still got sick. The weather was unpredictable. We were still crazy busy BUT He was so faithful. Out of nowhere, "I" remembered Riley needed new leggings for the school Christmas program. "Toys-R-Us" got the toy in stock that Piper had asked Santa for. I just "happened" to bring chips and salsa to a potluck that I didn't know was a potluck. These might just be happy coincidences for some, but I know they are all just three examples of His grace to me this December. I tried to explain this to my husband. I tried to get him to understand that to go without my lists was an act of faith - that I was trusting God to be in control and to just live the life He had given me that day without worrying about the next. He was so good to be so involved in the minor details of my little life. God taught me so much about humility this Advent season and a lot of it was through my NO-List Christmas. She raised her hand to speak during the meeting at church. “I asked the Lord to not allow me to say anything” was how she began to share her thoughts. (Ponder that my friend and, after reading what she said, let me know what you think!) Yet...she continued...“This is my church and I have raised my kids here… (translated "I have been here longer than you") and you, pastor, have come here …” (translated "you don’t love it as much as I do"). After hearing the phrase “my church” way too many times, and many hurtful things that went along with it (which, by the way, she later called and apologized for), I bolted out of the room in tears, enraged, sad, frustrated, telling myself this is why I am allergic to business meetings and prefer to not attend. I have thought about those words a lot since that evening. Her intentions were not to say it really was her church…after all…she KNOWS it is Christ’s church. Right? We say things like that all of the time. ‘I love my church’. ‘Why don’t you visit our church’? ‘Come hear my pastor.’ So why was I so upset? Fast forward to the post I wrote a couple of days ago….where I wanted to be ‘just like her’. Where I said I wanted her life. Where I talked about my house and my life. I pondered what I wrote…and it hit me! The very thing that upset me about the lady talking about her church as if it really belonged to her…..I was doing the very same thing!! Sure, I KNOW fundamentally it is NOT my life…it belongs to the One who created it and the One that I live for….yet often I treat it as if it is mine!! How easy it is to be critical of the things others do or say and forget that we do and say the exact same things!! It is not my job to judge her intentions….it is my job to not be judgmental. Again…forgive me Lord!!! It’s January 2, 2015 and I am pretty sure I should write something provocative or insightful or philosophical about looking back on 2014 or starting 2015…but I am not. I guess I am a ‘rule breaker’ from way back! After pondering my last post (why do I seem to continually write about comparing myself?? I then proceeded to beat myself up for not being creative and yet, at the same time, congratulated myself for at least being consistent) I was bothered by some things I said and feel the need to clear them up. First bother here....next bother coming up. I mentioned something about my friend’s husband having a ‘successful’ ministry. For some reason I have not been able to get this off of my mind. Why in the world would I say something like that? Does that mean there are ‘unsuccessful’ ministries? If so, how are ‘successful’ or ‘unsuccessful’ ministries defined? Normally the SBC takes ‘inventory’ using the numbers that churches send in to their state offices at the end of the year. (Oh yes!! Here it is! I can actually tie in the new year after all!!) Typically, on a regular basis, churches track the number of baptisms, Sunday school attendance, church attendance, new members, etc. to see ‘how they are doing’. Often bar charts or pie charts are made using Excel (which I love, by the way) and discussions follow around office desks or conference tables or coffee shops analyzing what the numbers say. "Oh look! We had a 'successful' year!" On the other hand, perhaps the numbers cause us to be discouraged and even doubt our purpose. Perhaps, without even realizing it we define how 'successful' or 'unsuccessful' our ministries are by the number of new members we have (or don’t have), the number of people who leave the church, the number of ________ ________ _____(you can fill in the blanks). Those are all important statistics but do they determine if a ministry is ‘successful’? If we are not careful we can find ourselves putting labels on our ministries: SUCCESSFUL (then pride sets in)! UNSUCCESSFUL (then discouragement sets in)! My friend, it is not our job to do that. God’s ways are not our ways. His Word does not return void. We cannot always see into the hearts of those we are counting for reports. Forgive me Lord for labeling our ministry as either ‘successful’ (and being prideful) or ‘unsuccessful’ (and being discouraged). Help us to keep our eyes and heart and mind on You...when we fail may we fall to our knees in repentance and help us to define failure by Your word not statistics or what other people say or think or how we feel. We are successful in Your eyes because of Christ!! In Jesus' name....amen! !